Qualitative research seeks out the 'why' and 'how' of its topic, rather than statistics or numbers to provide insightful information and support business decision making. 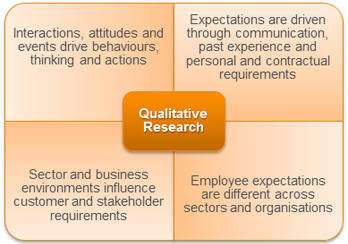 Qualitative research is used to gain insight into people's attitudes, behaviours, expectations, values, concerns, motivations, aspirations or culture. It's used to inform business decisions, policy formation and communication and supports research design of quantitative studies. We use innovative and insightful solutions to report qualitative research, bringing commentary and the context of market and business environments to life. Why Does Understanding Buyer Behaviour Keep Businesses Ahead of the Competition?